Here is a delicious, fun way to use up your leftover Passover macaroons. Every year I buy a container because it's tradition, but 8 days later, Passover is over and I usually have more than half the container left. No more waste! I love repurposing ingredients. Marcy Goldman came up with this genius recipe where you basically make a Kosher for Passover brownie and then fold in chopped macaroons. It tastes even more delicious if you use her glossy fudge frosting on top. These are dense, not light, so I'd recommend cutting the brownies into bite-size pieces. And if you really want to keep things interesting, try using other macaroon flavors than chocolate. 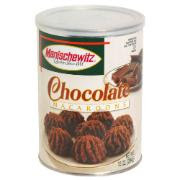 Doesn't Manischewitz make a toffee flavored one? And a banana split flavored one! Mmmmm. Preheat the oven to 350 degrees F. Lightly grease an 8x10-inch or 7x11-inch brownie pan or (in a pinch) a 9x9-inch baking pan will do. In a saucepan, melt the chocolate and butter or margarine over low heat. Cool to room temperature. Stir in the brown and vanilla sugars, eggs, cake meal, potato starch, and salt. Stir in the macaroon pieces. Spoon the batter into the prepared pan and bake for 40 to 50 minutes, until the top seems set and is beginning to take on a crackled appearance. Do not overbake. The brownies should be set and seem dry to the touch, but there should no be a dry crust around the sides. Cool the brownies in the pan until serving time or, let them cool to room temperature if frosting. Cut into squares. Heat the water or coffee in a small saucepan. As it comes to a boil, reduce the heat and stir in the chopped chocolate. Remove the pan from the stove and stir until the chocolate is thoroughly melted. Cool in the refrigerator for about 30 minutes. Whisk in the softened butter or margarine and spread the frosting on top of the cooled brownies. Decorate the top by running the tines of a fork through the frosting. Let the frosting set, then slice and serve!